Bold leaves White Deer Park, and heads out onto the downland, where he meets a Crow. Crow is suprised that Bold is out in the daytime, is he not afraid of the humans? Bold continues on his way and catches himself a pheasant. 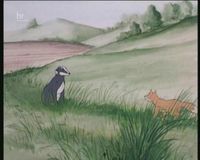 He rests in a badger’s set and meets Shadow, a young badger, when she returns home. Shadow warns Bold that the human, who lives in a cottage nearby, kills Foxes as he wants the pheasants for himself. Bold sees the human’s cottage. The dead bodies of many foxes hang over the fence, but Bold refuses to be afraid. Little does he know that the human has laid a trap in the field. 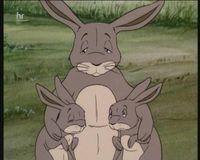 Back in White Deer Park, Scarface kills Hare’s wife, and a devestated Mr Hare brings his family back to live on Farthing land. Fox realises he must do something about Scarface, but does not want to start a war. Owl suggests killing Scarface by stealth. This is a job for Adder! 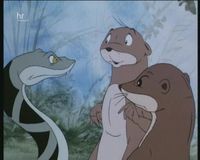 Fox gives Weasel and Measly the job of passing the message onto Adder, but the Weasels argue over the message, and Adder ends up thinking that Fox wants her to kill any blue fox. Meanwhile, Charmer is drinking from the stream, where she meets Ranger for the first time. They are instantly attracted to each other, and Ranger tries to persuade Charmer that they can be friends. Outside the park, Bold finds Shadow trapped in the human’s trap. He releases her just before the human arrives, but badly gashes his eye in the process, when the trap springs open in his face. After catching Shadow a pheasant, Bold says goodbye and continues on his way. He walks straight into a pheasant shoot, but does not see the hunter with his gun, until it is too late. Running for safety, Bold is shot. Back in the park, Ranger’s older brother, Bounder takes over patrol duty. 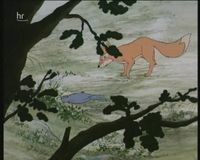 Bounder is bitten by Adder and dies, witnessed by Whistler who flies to tell Fox that Adder has killed the wrong fox. Charmer is relieved to realise it was not Ranger, but Fox is furious. Vixen and Badger suggest it may be down to the younger generation to sort things out, and Fox turns on Badger. You don’t know what your talking about, you old codger. Offended, Badger storms off home. Vixen wonders how life is treating their poor Bold. Poor Bold! retorts Fox He deserves whatever he gets! Far from the park, with a badly wounded leg, Bold limps to find shelter.